After huge success with the MKM Series circuit, we're happy to invite you to the next stop: MKM Series London! Every participant receives a MKM Series 2016 playmat by Titus Lunter! Prizes: At least 4000€ in MKM vouchers. Prizes: At least 560€ in MKM vouchers. Additionally, the best Budget Vintage Deck, if in the Top8, wins an additional 150 €. See more details at http://series.magiccardmarket.eu/mkm-se ... 16/#prizes . Prizes: At least 2000€ in MKM vouchers. On top of the events listed above, as soon as 16 players sign up, we will start tournaments in various formats on every day of competition. Prizes: Booster packs and a playmat for the winner of each 8-Player event! Magiccardmarket offers the winners of each Trial FREE entrance for the MKM Series main event in the corresponding format with 1 Bye and a MKM playmat. Official MKM partners can request a merchandising package with MagicCardMarket gaming materials (life pads, pens and sleeves) once per season. 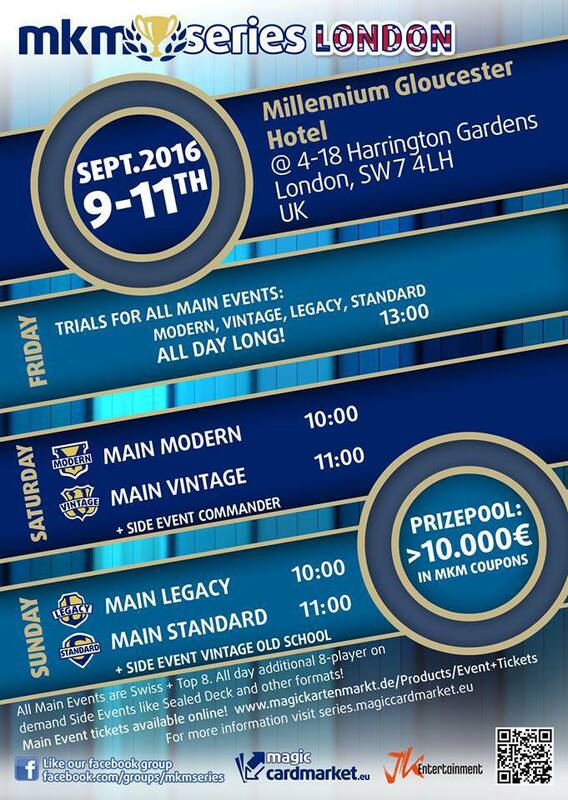 If you want to run a trial for one of our main events, you can find out all information at http://series.magiccardmarket.eu/trials/. Who's coming? There's still tickets available. This is a Dutch forum, I wouldn't expect too many as it's not in The Netherlands. I believe we're also mostly casual players, though I could be wrong on that.